The Japanese bridge in Hoi An ( Chùa Cầu in vietnamese) is an attraction that everyone will recommend but do you really know its history? 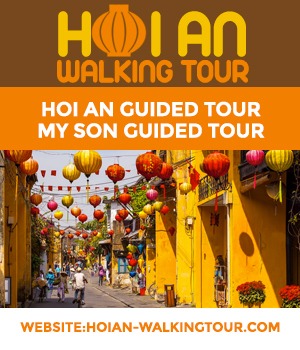 Good Morning Hoi An is there for you to learn more and see the bridge from another angle. It was built in 1593 to connect the Japanese neighborhoods with Chinese in the city. Its Vietnamese name is Lai Vien Kieu name meaning bridge of distant friends. It is guarded at both ends by two statues representing a monkey and a dog that represent the year of the beginning of its construction (Year of the Monkey for the start and ended the year of the dog). It was completed within 3 years (1593-1595) and was restored in 1986 It measures 18m long and is 3m wide.. Crossing the bridge is completely free and fees are only applicable for visits of the pagodas. The bridge represents the body of a monster called Cu whose parts are scattered with the head in India, the tail in Japan and of course the body in Hoi An and it is to keep the spirit of this monster that looks like a dragon that the pagoda was built. Another story tells that this is a tribute to a Chinese traveler that the pagoda was built. The visit is payable. This Vietnamese national treasure is visible on the 20,000 Vnd note.